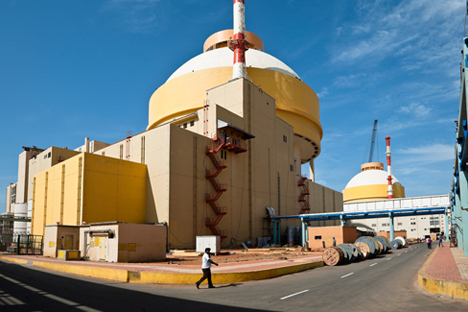 The attainment of criticality at the first reactor of the Kudankulam Nuclear Power Plant is a major milestone and should not be underestimated. Last week, the first reactor of the Kudankulam Nuclear Power Project in the southern Indian state of Tamil Nadu attained criticality, a development lauded equally in Russia and India. Nuclear engineers always look forward to the first criticality the way doctors look forward to hearing a newborn baby cry for the very first time. If a power unit attains first criticality then the unit is considered operational. There is the opinion that the nuclear plant is 50 percent reactor and 50 percent the casing, pumps and other equipment. I believe first criticality to be the heart of the reactor – in our case, a healthy and safe heart, because it is the most up-to-date project and meets all safety requirements, both passive and active. We shouldn’t underestimate this achievement, which is a milestone for nuclear engineers, investors and consumers in India, because India needs nuclear power to improve its living standards and spur economic growth. This process is much like the launch of a carrier rocket, which has not only passed all atmospheric layers, but also successfully reached the intended orbit. I consider the attainment of first criticality to be a serious guarantee of our shared success and prospects for the future. We have pursued the unification of approach towards nuclear projects recently, but that does not mean we will no longer use a customised approach to safety systems at nuclear power plants. We always factor in the peculiarities of the location, in our case, of the southern Indian region with its storms and typhoons and other acts of nature, when we work on a nuclear plant project. You cannot use the same project in various climates and make no adjustments. Our nuclear projects are safe in all respects – the time of service, climatic conditions and population – because all parameters are accounted for when we work out a single safety system for a project. First criticality marks the completion of sophisticated engineering work carried out by professionals, for it is a crucial step in the operation of a nuclear power plant. We can now think about prospects for the future and new reactors, an issue that is high on India’s agenda. Dr Nikolai Kuzelev is Deputy Director of Anthropogenic Diagnostics Research at the Research Institute of Introscopy of MSIA Spectrum, and Vice-President of the Russian Society for Non-Destructive Testing and Technical Diagnostics. First published in Russian in Energy Expert Centre.